Visible Thinking is a research-based approach to teaching thinking that develops students' thinking dispositions, while at the same time deepening their understanding of the topics they study. 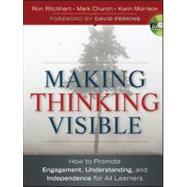 Rather than a set of fixed lessons, Visible Thinking is an extensive and adaptable collection of practices that include thinking routines and the documentation of student thinking.The routines are a central element of the practical, functional and accessible nature of Visible Thinking. Thinking routines are easy to use mini-strategies that are repeatedly used in the classroom. They are a small set of questions or a short sequence of steps that can be used across various grade levels and content. Each routine targets a different type of thinking and by bringing their own content, teachers can integrate the routines into the fabric of their classrooms.Thinking Routines help direct student thinking and structure classroom discussion. Thinking becomes visible as the students' different viewpoints are expressed, documented, discussed and reflected upon. Part One Some Thinking about Thinking. Beyond Memorization, Work, and Activity. A Map of Thinking Involved in Understanding. Uncovering Students' Thinking about Thinking. Two Putting Thinking at the Center of the Educational Enterprise. How Does Visibility Serve Both Learning and Teaching? How Can We Make the Invisible Visible? Part Two Using Thinking Routines to Make Thinking Visible. Three Introduction to Thinking Routines. Three Ways of Looking at Thinking Routines. How Are the Thinking Routines Organized? Four Routines for Introducing and Exploring Ideas. Five Routines for Synthesizing and Organizing Ideas. I Used to Think. . . , Now I Think . . .
Six Routines for Digging Deeper into Ideas. Part Three Bringing the Power of Visible Thinking to Life. Seven Creating a Place Where Thinking Is Valued, Visible, and Actively Promoted. Making Time for Our Own Learning. The Making of an Elaborated Conversation. The Forces That Shape Culture. Eight Notes from the Field. The Challenges of Making Thinking Visible in a Mathematics Class and Beyond: The Case of Mark Church. Content + Routines + Students = A Culture of Thinking: The Case of Sharonne Blum. Stages of Development in the Use of Thinking Routines. How to Use the DVD.